In view of a lukewarm response to the policy of regularisation of illegal colonies, the state government today extended the deadline to October 25. More than 1,500 colonisers and one lakh individuals submitted their applications till this evening in various parts of the state and deposited Rs 125 crore as regularisation fee. A rush of applicants at a civic body office on Monday. The much-hyped drive of the Punjab Government to identify and penalise illegal colonies in Patiala not depositing regularisation fee has drawn flak with only five colonisers turning up to deposit the fee today. Over 750 plot owners also applied to get their plots regularised. Over 13,500 individual plot-holders and building owners and 77 colonisers in Jalandhar and its neighbouring areas applied for regularisation of their property today, which was earlier fixed as the last day for the purpose. In all, 773 colonies had been identified as illegal in these areas. 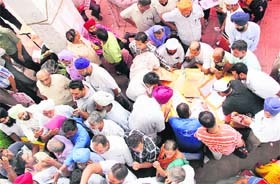 The authorities in four border districts of Amritsar, Gurdaspur, Pathankot, and Tarn Taran collected more than Rs 14 crore as composition fee. A total of 6,000 individuals and 152 colonisers submitted their applications in these four districts. Since the server of the Amritsar Development Authority (ADA) was down all through the day, the officials accepted the applications manually. Shakeel Ahmed, AICC general secretary, who is in charge of the party affairs in Punjab, today ruled out a pre-poll pact with any political party in the state. This puts to rest all speculation regarding a Congress-PPP alliance for the ensuing parliamentary elections. It seems the Congress has decided to take on the SAD-BJP alliance alone. A Congress delegation would soon meet Union Home Minister Sushilkumar Shinde to bring to his notice the “partisan” behaviour of certain IPS and IAS officers in Punjab, said Shakeel Ahmed AICC general secretary, while addressing a public rally in Jalalabad, the constituency of Deputy Chief Minister Sukhbir Singh Badal. With the growing human activity in the Beas, the conservationists are worried about the safety of the rare Indus dolphins, a number of which have been spotted in the river in recent past. Deputy Chief Minister Sukhbir Singh Badal today lashed out at the UPA government for its “failure” to revamp the existing fertiliser units in the country which led to a fall in the production and an outgo of Rs 79,743 crore subsidy. ough gypsum importers had threatened to stop imports from Pakistan today, officials at the Integrated Check Post (ICP) at Attari said 10 truckloads of the commodity had arrived today. Tejinderpal Singh Soni, 38, son of SGPC president Avtar Singh Makkar, died at the PGIMER, Chandigarh, today due to renal failure. He was admitted to the PGIMER on October 1 with severe infection. The Punjab Government plans a show of strength during the stone laying ceremony of a temple at Sri Valmiki Ashram in Amritsar on Valmiki Jayanti (October 18). The occasion assumes importance as it comes after the recent outburst of Amritsar MP Navjot Sidhu against the SAD-BJP Government. Employees of the National Rural Health Mission (NRHM) today began a two-day pen-down strike, affecting the functioning of hospitals, dispensaries and offices of the Health Department. While assuming charge as Industries and Commerce Minister here today, Madan Mohan Mittal said illegal mining, if any, would be dealt with a heavy hand. He said as chairman of the District Planning, Ropar, he was the first to raise the issue and put tabs on illegal mining in the district. The Punjab Government wants the Centre to pay for making state jails secure. For installing jammers, baggage x-ray scanners, metal detectors and other devices in jails, the state government has sought a special package of Rs 832 crore from the Centre. Five persons, including a woman and her daughter, were killed when a private bus rammed into a truck near Arayiawala village in Makhu, 40 km from here, today. The bus was on its way from Ferozepur to Amritsar. The district police today arrested 12 drug smugglers, including seven members of a gang. Various cases of dacoity and drug smuggling are pending against the gang members at various police stations in the state and Haryana. A Vigilance Bureau team today caught red-handed an Assistant Registrar of Cooperative Societies, Surjit Singh, while allegedly accepting a bribe of Rs 10,000 from a former village society representative. In view of a lukewarm response to the policy of regularisation of illegal colonies, the state government today extended the deadline to October 25. More than 1,500 colonisers and one lakh individuals submitted their applications till this evening in various parts of the state and deposited Rs 125 crore as regularisation fee. The government, however, was expecting to raise at least Rs 1,000 crore. At a meeting held today to review the policy, the state government exempted all the plots and colonies developed before 1995 from regularisation. The meeting was presided over by Deputy Chief Minister Sukhbir Singh Badal. It has been decided that the first registered sale deed of the plot would be the basis for charges. It has also been clarified that in case of colonies, the year of sale of 50 per cent area or 50 per cent units would be the basis for establishing the time of its setting up. After October 25, plot holders and colonisers can still get their plots/colonies regularised by paying a compounding fee till November 5. Plot holders will have to pay a compounding fee of 20 per cent and colonisers 50 per cent. Sukhbir directed the officials concerned to accept forms both manually and online. He said all plot holders in the below poverty line (BPL) category could get their plots up to 100 sq yds regularised free of cost. In Moga, members of the District Bar Association held a protest against “hefty” fee being charged for regularising illegal colonies. The lawyers’ body urged the Punjab and Haryana High Court Chief Justice to take suo moto cognisance of the “unjust” order of the state government. Colonisers have called the new collector rates "unfair" and said that these were not in consonance with rates at which they had purchased properties. The Ludhiana Municipal Corporation managed to generate a revenue of more than Rs 23 crore. There are around 9,000 illegal properties in and around the city. In Ropar, 1,156 applications, including 79 from colonisers, were received. In Sangrur, the regularisation policy evoked a poor response. Sources said there were 203 unauthorised colonies within the municipal limits and 143 outside the municipal limits in Sangrur district. However, promoters of only 56 colonies within the municipal limits and 12 outside have applied for regularisation. There are thousands of houses and plots in these unauthorised colonies. But only 1,239 plot holders have applied. In Barnala, there are 73 illegal colonies within municipal limits . Promoters of only 11 colonies have applied for regularisation by depositing Rs 3.25 lakh as composition fee. Besides, 1,000 plot holders have applied to the municipal council, Barnala. They have deposited Rs 1.5 crore fee. A huge rush was witnessed at the Jalandhar Development Authority (JDA) and the local Municipal Corporation, the two designated points for submitting applications under the policy for regularising unapproved colonies. Corporation Senior Town Planner Trilok Singh said, “We have received around 13,000 applications. Fifty-two colonisers are among the applicants.” There are 323 illegal colonies within the civic body’s limits. Chief Administrator (JDA) Jaskiran Singh said, “Around 850 plot-holders and building owners and 25 colonisers have so far applied to us for regularisation.” As many as 450 colonies are approved in the areas falling under JDA jurisdiction. A similar rush was witnessed in the neighbouring districts of Hoshiarpur, Kapurthlala and Nawanshahr district of the Doaba region. There are 887 unapproved colonies in these four districts. A maximum of 3,897 applications were received from Amritsar, which has 405 illegal localities. A heavy rush was witnessed at certain centres. An applicant, Kulwinder Singh Bhatia, who was in a queue at one such centre, said he faced much difficultly in depositing the application owing to non-availability of forms and refusal of the centre to accept cash after 2 pm. Another applicant Vikram Kumar said the government gave limited time to the public to submit the applications. He said the time limit must be extended to accommodate more people. Ahmed said his party would take up the issue of the aggravating law and order situation and the “witch-hunt” of Congress workers with the Union Home Ministry. 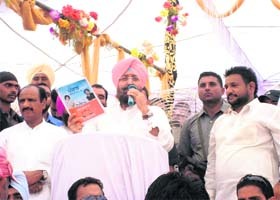 He instructed Punjab Pradesh Congress Committee (PPCC) chief Partap Singh Bajwa to prepare a list of “vendetta cases”. He alleged that the polce was victimising Congress workers at the behest of SAD-BJP leaders. Ahmed said the Congress would announce the names of Lok Sabha candidates in the state well in time.The list of PPCC office-bearers would also be announced soon. Ahmed said Congress Legislature Party (CLP) Leader Sunil Jakhar had yesterday submitted a report on the outburst by Rajasansi MLA Sukhbinder Singh Sarkaria against the PPCC chief. He said appropriate action would be taken in consultation with the party high command. Ahmed said the party had taken cognisance of reports on former Law Minister Ashwani Kumar inviting Chief Minister Parkash Singh Badal to inaugurate an old-age home at Jeevanwal in Gurdaspur, ignoring his own party MLAs and the PPCC chief. “I spoke to him and he has clarified things” Ahmed said, adding that the party would formulate a policy on inviting leaders and workers to various functions and fora so that such unsavoury incidents did not recur. Factionalism between Congress groups led by former Congress minister Hans Raj Josan and Youth Congress leader Jagdeep Kamboj alias Goldy came to the fore at Jalalabad. Shakeel Ahmed and Partap Singh Bajwa’s cavalcade was virtually gheroed by Goldy’s supporters near the Jalalabad bus stand. He pleaded that the leaders had tea at his residence. As Ahmed and Bajwa turned down the request, 200 Youth Congress workers gheroed their car. The leaders had no choice but to relent. Jalalabad Block Congress Committee president Raj Baksh Kamboj, welcoming the Congress stalwarts, had a dig at the Youth Congress faction, accusing it of trying to capture the stage. Unruly scenes were witnessed on the stage thereafter. Former minister Josan and Goldy had a spat even as Shakeel Ahmed addressed the gathering. As Pradesh Congress chief Bajwa addressed the gathering, he warned the warring factions, asking them to maintain discipline. He reprimanded them and threatened to initiate disciplinary action. This subdued the warring groups. Ahmed admitted that wrong distribution of the party ticket had resulted in the Congress defeat in the 2012 assembly poll. Leader of the Opposition Sunil Jakhar, Congress MLAs Amarinder Singh Raja Warring, Karan Kaur Brar, Ranbir Singh Nabha, Rana Gurmit Singh Sodhi and Parminder Singh Pinki were present on the occasion. He alleged that Chief Minister Parkash Singh Badal had been purchasing votes since 1957. He said the SAD-BJP Government’s wrong policies had left the state bankrupt. “The SAD, which claimed to be the champion of the Panth, has denigrated to such an the extent that it is looking for brand ambassadors in film stars like Priyanka Chopra and Kareena Kapoor,” he said. The World Wildlife Federation has put their number around 15 to 20, up from two to four when the dolphins were spotted for the first time in the river some time back. Compared to the Beas, their population is more than 1,100 in the Indus in Pakistan. Though the rise in population is a welcome sign, activities like unchecked use of boats and fishing through nets could prove disastrous, say wildlife lovers. The recent boat capsize tragedy in Tarn Taran has brought into focus the unregulated use of boats by villagers. Sources say almost every household across the Beas owned a boat of its own. The federation has shared its concerns regarding the safety of the dolphins with the Punjab Wildlife authorities. It has demanded either a bio-diversity heritage site or a conservation reserve status to the 85-km stretch of the Beas to protect bio-diversity in that region. Such a move may also enable the state government to seek more funds for the purpose from the World Wildlife Federation and other bodies active in the field. He says there is a need to keep a check on human activity in the river. “Licences should be issued for plying boats. There should also be clear instructions that no one will touch the dolphins,” says Gurmeet. Besides, the conservationists have stressed on the need to maintain the quality of water in the river. In a statement issued today, Sukhbir said instead of taking steps to increase production, the Congress-led UPA opted to decontrol the sector, thus putting a burden on poor farmers. “The Centre’s move to decontrol the fertiliser sector led to a substantial hike in the prices of DAP and urea,” he said. Quoting a CAG report, Sukhbir said 475.29 lakh tonnes of fertilisers were imported in the past nine years and Rs 79,743 crore was given by way of subsidies. He said had the Centre assured supply of uninterrupted natural gas to the fertiliser industry, the subsidy could have been saved and utilised for the welfare of farmers. Leading importer Iqbal Singh Bedi said they had stopped gypsum import but the trucks in queue on the other side could not be prevented from crossing over to India now. However, sources said, the traders were still mulling over their next move and the final call regarding stopping the imports would only be taken after October 15. Sources said the traders appeared divided on their stand against the storage tariff hike implemented at the ICP by the Land Port Authority of India. While some of them were firm on stopping imports, others wanted to continue while adopting a wait-and-watch approach, they said. He is survived by his wife, a son and a daughter. He was the youngest of three siblings. The cremation will take place at the Model Town Extension crematorium in Ludhiana at 11 am tomorrow, said family sources. Chief Minister Parkash Singh Badal expressed grief over the death. Deputy Chief Minister Sukhbir Singh Badal and Information and Public Relations Minister Bikram Singh Majithia also mourned the death. Former Chief Minister Capt Amarinder Singh expressed sympathies with the bereaved family. Raghujit Singh Virk, SGPC senior vice-president, Kewal Singh Badal, junior vice-president, and Sukhdev Singh Bhaur, general secretary, also expressed grief at the untimely death. Highly placed sources said Chief Minister Parkash Singh Badal had been meeting senior SAD leaders and halqa (area)chiefs to assign them responsibilities for the October 18 function. “Leaders in some constituencies have been asked to arrange for 20 to 30 buses to ferry supporters,” the sources said. 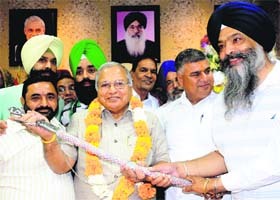 Cabinet Minister Surjit Singh Rakhra said efforts were on to make the Amritsar function a grand success. “We will make sure that over two lakh workers attend the function,” he added. Staff nurses working at the 24x7 health centres did not conduct deliveries and ANMs in dispensaries did not vaccinate the newborn or undertake post-natal checkup. District president of the NRHM Employees Union Amarjit Singh said if their demands were not met soon, they would hold rallies at all district headquarters on Thursday. He said their main demand was regularising the services of the NRHM staff. The other demands included implementation of the notification issued in 2011 to regularise the services of the ANMs, appointment of NRHM employees in the Health Department against vacant posts and cancellation of the tender issued to bring NRHM employees under a company. Mittal said the issues, problems and grievances of the industrial sector would be given a priority. He said he would industry friendly atmosphere for economic growth of the state. Mittal alleged despite attempts of the Central Government to scuttle Punjab's industrial development, the state was witnessing massive growth in this sector, which could be assessed by the recent visit of Tata group officials and interest shown by other big industrial houses. Mittal earlier held the portfolio of Health and Family Welfare. He was made Industries Minister after the state BJP reshuffled portfolios of its ministers on September 24. As a petition filed in public interest on the issue came up for resumed hearing before the Punjab and Haryana High Court, the state informed the Bench that a formal proposal had been sent to the Centre. Eyewitnesses said the accident occurred as the bus driver tried to overtake the truck. Three of the deceased have been identified as Kulwinder Kaur, her daughter Pawandeep Kaur (6), and Narinder Kaur. 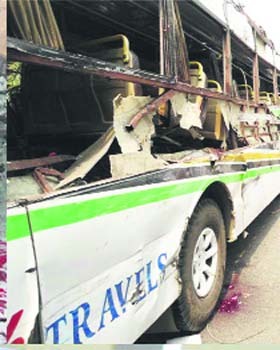 Kulwinder’s husband Gurjit Singh, along with their two other children, was trailing the bus on his motorcycle. More than 10 passengers sustained injuries. They have been hospitalised. Among the injured is Harcharan Singh, deceased Narinder Kaur’s husband. They were on their way to Amritsar to pay obeisance at the Golden Temple. “We wanted to thank the Almighty as our dream to move abroad had finally come true. Our visas had just arrived,” said, Harcharan. The police seized a .315 bore pistol, three live cartidges, iron rods, daggers, four stolen motorcycles, 500 gm of opium, 14 gm of smack, 10 gm of heroin, 52 kg of poppy husk and 33,000 intoxicant tablets from their possession. Gurmreet Singh Chauhan, Senior Superintendent of Police, said the accused had been arrested from a cattle mandi in Nabi Pur village. Those arrested include Ranbir Singh of Badochi Khurd, Vatanvir Singh of Sidhwan, Manpreet Singh of Madhopur, Lakhbir Singh of Majri Sodian, Gurpreet Singh of Bhamarsi Jer, Sukhwinder Singh of Century Enclave, Patiala, and Tarsem Singh of Badochi Kalan. The police also arrested drug peddlers Manjit Singh alias Raju of Hamayunpur, Sirhind, and Nirdosh Kumar of Sirhind city and seized 500 gm of opium from their possession. The police also arrested Manpreet Singh alias Mana with 1,100 intoxicant tablets, Mohit Sharma of Bhatmajra with 10 gm of heroin and Baghel Singh of Khanna for possessing 52 kg of poppy husk. Deputy Superintendent of Police (Vigilance, Patiala) KD Sharma, who led the operation, said the accused was nabbed in the presence of two witnesses. Sharma said the accused had demanded Rs 35,000 as bribe from Kulwinder Singh, the former president of Harlalpur Cooperative Society, for holding elections to the village society. The deal, however, was fixed at Rs 15,000. In his complaint, Kulwinder alleged that Rs that 5,000 was paid on October 3 while the rest of the amount was to be paid today. Kulwinder said elections to the society were due and a meeting was convened on September 13. However, no official from the Assistant Registrar’s Office turned up for the meeting to hold the elections. He said when he took up the matter with the Assistant Registrar, the latter demanded the bribe. The Vigilance officer said the department had video-graphed the entire episode. He said a case had been registered and raids were being conducted at the accused’s houses in Sirhind and Chandigarh. The Assistant Registrar, however, claimed he had passed orders for holding the elections on September 13. He said he had even deputed two inspectors, Surinderpal Singh and Baldev Singh, for the process.